Do I have a bucket list? Not really. I’ve done many things in my life, lived in a number of wonderful places, traveled to amazing destinations. Of course, there are other thing I’d like to do, but the list is in flux and I don’t feel prevented from doing them, it’s more a decision about timing and life balance. That changed when a few weeks ago I realized that I have perhaps missed the underlying meaning of a bucket list. I do have things I’d like to do, but know I won’t. Is that what is on a bucket list? What’s holding me back? Me. (Technically I think I may like the IDEA of doing these things more than the actual experience. No…. as I type these words I think, that’s wrong. I would love them. Okay, one of them might turn out to be a REALLY bad idea. You decide. But the other would be amazing.) The first is to travel the Silk Road. There are probably several ways to do this, however, one is organized by a well-respected travel group as a 47 day journey from China through Kyrgyzstan, Uzbekistan, Turkmenistan, Iran and Turkey. I don’t need to explain why this would be amazing. Upon review of their material I know that I could handle the basic requirements: decent health and the ability to drive a Range Rover. They state very clearly that they provide clean water throughout the trip (a plus). I’ll skip the other details, which outline what would surely be the most incredible trip of a life time – of anyone’s lifetime really, including Marco Polo’s and he started the whole adventure. (Let’s exclude astronauts from the “anyone’s lifetime” list. They get their own category.) Why am I not signing up to travel the Silk Road? Fear. Geopolitics. When I fly OVER some of these places in a commercial airline I am relieved to note we’ve ascended to 42,000 feet (which I have been assured is above the range of certain missiles). If traveling ABOVE these countries is a questionable notion, then driving on the ground with my American passport, is probably not a good idea. I know that the people there are wonderful as individuals, but….. geopolitics intrude and this trip qualifies as don’t do anything that will get your picture on CNN. Call me chicken. I have another trip I’d like to make. 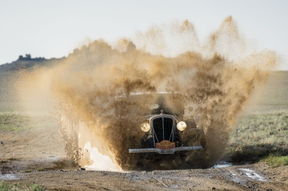 The Peking Paris Road Rally. Clued in by the old-fashioned name? The Rally is a 8,510 mile, 36 day trip (drive? journey? slog?) across 11 countries from Asia to Europe undertaken in a pre-1975 automobile. China, Mongolia, Russia, Belarus, Poland, Slovakia, Hungary, Slovenia, Italy, Switzerland, and France. Think about it! Technically there are two divisions, pre-1975 and then pre-1945. Seriously? I would have to go pre-1945. 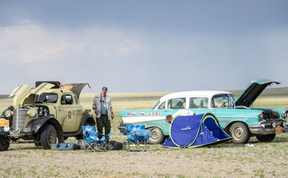 Imagine cruising across Mongolia in a 1920s Silver Ghost!Here are the rules. Each team (duo) must carry its own weight, and the organizers mean that literally. 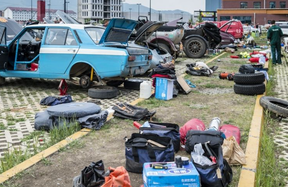 Tents, sleeping bags, spares, and supplies must all be loaded onto the rally car itself. (Again, the Silver Ghost seems like an excellent choice. Roomy.) Period attire is encouraged and vehicle modifications are a no-no. 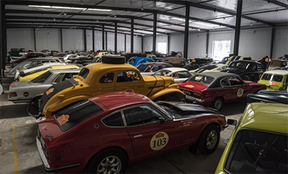 As the organizer points out: “Cars must be prepared in a period-style. No alloy-boxes on the back, no modern-looking ski-boxes or roof-top boxes. Appearance matters. Ratchet straps come in black and are preferable to bright blue, but leather straps do the job just as well and are more in keeping with the spirit of the event…. Crews must remember! 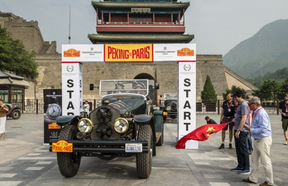 Prince Borghese is looking down!”Prince Borghese was winner of the inaugural 1907 Peking-to-Paris race—although it’s said his chauffeur did most of the driving. Cleary the man was a stickler for style and authenticity.What’s holding me back? A near total lack of knowledge about cars or engines. I would need to acquire an appropriate car and bring an experienced mechanic as my travel partner (don’t forget that some nights are spent sleeping in the car, or at best in the tent…..choose your partner wisely). On the other hand, maybe I’ll get lucky and someone will want a travel partner and pick me! They can provide their favorite vintage car, do the mechanical part and I will provide support and a willingness to chat, or be silent… or read aloud. I can already drive any vehicle with a clutch – no matter how tricky – and could fit in some pre-travel mechanic’s lessons. Plus, I’m fearless (forget everything I said about the Silk Road trip….it doesn’t apply here). Maybe I should convince the Mystery Writers of America to challenge the International Thriller Writers and sponsor a bunch of cars (with mechanics). Think of all the good stories…. What is on your bucket list? Join the MissDemeanors on Facebook and share! What is on your bucket list?